From being a member of the ‘fragile five’ economies over 4 years ago, India is now the world’s fastest growing, lifting hundreds of millions of people out of poverty through innovative investments in social welfare, tax reform, digitisation, infrastructure, education and clean and renewable power. Present in Melbourne to describe this epoch-making transformation was the honourable Union Minister of Ministry of Human Resource Development, Shri. Prakash Javadekar, of the ruling Bharatiya Janata Party (BJP). Overseas Friends of the BJP (OFBJP), in conjunction with the Australian Indian Chamber of Commerce, were delighted to host Hon. 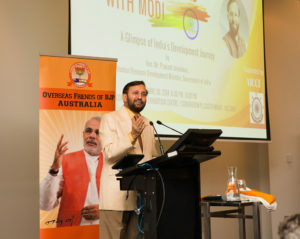 Shri Prakash Javadekar at the event, “Moving Forward with Modi,” held at the Melbourne Convention Centre on June 30, 2018. Present to felicitate the Minister were the Hon. Kevin Andrews, Federal Member for Menzies from the Australian Liberal Party, Hon. 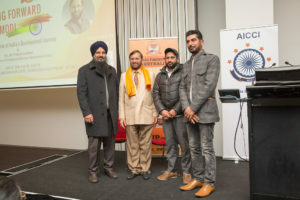 Robin Scott, Minister for Finance and Minister for Multicultural Affairs and Member for Preston in the Australian Labour Party, Mr. Ravi Bhatia, ex-CEO of iPrimus and Chair of the AICCI, OFBJP Australia General Secretary, Balesh Singh Dhankar, and the leaders of several Indian community organisations reflecting the diversity of the Indian diaspora in Melbourne. Shri. Javadekar’s talk focused on the nation-building efforts of the BJP in 3 areas – clean, transparent governance, all-round development, and education. Minister Javadekar highlighted several schemes. The GST (Goods and Services Tax) makes India a single, common market, improving ease of doing business and is expected to add 3.4M new indirect taxpayers, 2-2.5% to GDP, and 10-14% to export growth on an ongoing basis. Minister Javadekar cited the GST as a great example of cooperative federalism. “In 28 meetings, with 34 state and central ministers from every political party, every decision on the rates and rules was passed unanimously.” This will make it easier for Australian exporters to investors to do business in India. The government has also focused on boosting entrepreneurship through a micro-finance program. The Mudra loans program “has benefited 120 million people, and has resulted in the creation of 40 million new micro-ventures,” boosting employment and self-reliance. 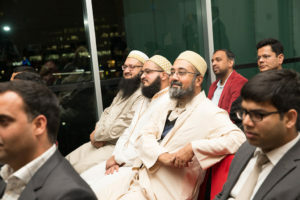 The Minister referred to India’s education system as being broken – with an undue emphasis on rote learning and theory and without a focus on local history or geography. His focus is on halving the curriculum to make room for physical education, life-skills, creative endeavours, and value-based education boosted by creative, experiential based learning. Victoria’s largest services export is education. The Minister called for greater joint cooperation with Australia universities. Earlier, the Hon. Kevin Andrews described how India and Australia are Indian Ocean neighbours with deep and shared democratic values. He quoted extensively from PM Modi’s speech in Sydney (‘We see Australia as a vital partner in India’s quest for progress and prosperity – there are few countries in the world where we see so much synergy as we do in Australia.”) and specifically called out the opportunities in clean coal, gas, high yield agriculture, and technology to save water and make cities smarter. Demonstrating bipartisan support for the Modi government, the Hon. 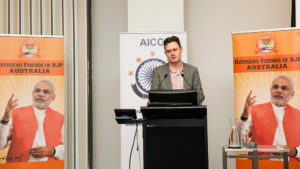 Robin Scott praised the Modi government’s achievements and highlighted the preparation of the Victoria-India strategy to boost social, cultural and economic ties between the state of Victoria and India. While she could not attend in person, Tasmanian Labour senator, the Hon. 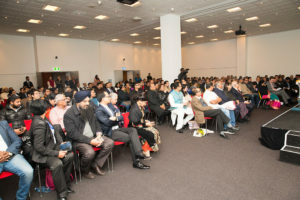 Lisa Singh, the only senator of Indian origin in Australia, highlighted the achievements of the Modi government and called for stronger ties. The diversity of the Indian diaspora was on full display as Sikh, Muslim and Hindu community groups separately felicitated the Minister. India has clearly, and objectively, made great strides in the last 4 years in establishing clear, transparent and effective action-oriented political and economic governance. The Modi government is on an urgent development mission to provide basic amenities and welfare to the people of India, regardless of community and region. As India continues its forward movement under PM Modi, it is clear Australian investors, businesses and educators will be well-received and warmly welcomed as partners in India’s success.